Writing across a lot of different genres is not necessarily a bad thing. I've always been a fan of the shotgun approach. Following up on literary fiction, crime/hard-boiled, and technical non-fiction, it's now time to dip my toe into science fiction. I have always been a huge fan of post-apocalypse science fiction. From Canticle for Leibowitz to Lucifer's Hammer, speculating on the direction our future is headed has always been fascinating to me. Political commentary in fiction can be even more effective than non-fiction. Classics like Brave New World as well as newcomers like the Hunger Games Trilogy have a way of making you think about the current state of affairs. How our children integrated into society? What future will they be left with? I did my best to try and incorporate some of the great works that have influenced me in this short novella, and I hope that you will enjoy it. Five hundred years after mankind was nearly destroyed by The Plague, a controlled society known as the Precinct continues the evolution of the human race. The Wardens select all children for their lifelong occupation at age 5 and the Administrators teach them for 15 years their duties and responsibilities to Society. Alan7347F is a 17-year old Student classified to be a Machine Operator, but he spends his days wondering about the demise of his Ancestors’ civilization. One night, a rogue citizen, the Vagabond, creates a simulation that allows Alan and his classmates to travel back in time to experience firsthand the chain of events that nearly destroyed humanity. However, as the simulation unfolds, it becomes unclear what its true purpose is. 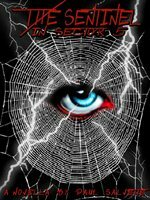 The Sentinel in Sector 5 is a 30,000-word sci-fi novella about the burning questions lingering in a young man's heart amid a restricted society. Like a cross between The Hunger Games and Brave New World, Sentinel in Sector 5 is sure to keep you entertained while making you think about where our civilization is headed. This novella is only $2.99 at Amazon, and please let me know what you think.